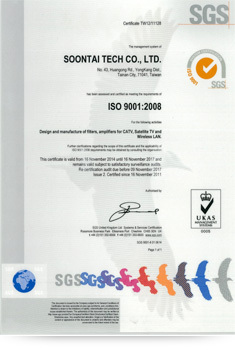 About Us-Soontai Tech Co., Ltd.
we always provide a superb choice for you. Founded in 1994, Soontai is headquartered in Tainan City, Taiwan. We design, manufacture and support wide portfolio of filter and accessories in CATV, SMATV, DVB, MMDS, LTE, DOCSIS , MoCA, and G.hn systems. Our entire team is dedicated to continuous innovation, quality consistency, solid reliability, and customer oriented services. Leveraging its core competencies Soontai has further extended his presence into the telecommunication, IoT solution, and cable broadband technology segments. We offer high precision calibration kits bundled with RF and microwave components and cable assemblies for 50ohm and 75ohm systems. Today Soontai is leading global supplier of RF and microwave connectivity and communication components in the frequency range beyond 60 GHz. Today Soontai is qualified supplier at many worldwide tier-one Multi-Services Operators (MSO) and Telco Operators. We are also strategic design partner of many esteemed semiconductor companies creating key core modules in relevant reference designs. Social participation, community contribution and care for social minority groups are essential part of Soontai´s corporate culture and are deeply rooted in our faith. Soontai´s team upholds the vision of Care for Society and constantly contributes efforts. In this way we fulfil our duty as global citizen and achieve the goal of business sustainability.